Glenn reveals to the group that there are walkers in the barn. 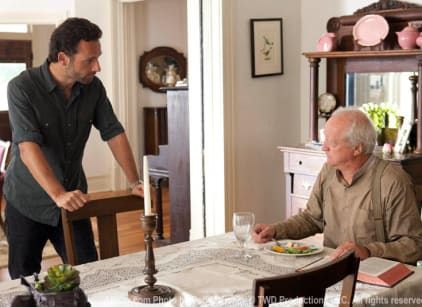 Rick attempts to speak with Hershel who tells him they must leave by the end of the week. Maggie pleads with her father about allowing the group to stay. Hershel agrees to let Rick stay as long as he recognizes Hershel's views of the zombies. Dale attempts to hide the guns fearing Shane will take drastic action. He does. Rick helps Hershel retrieve two walkers from the swamp to place in the barn. Shane hands out the guns and releases the walkers from the barn. He and the others kill all of them including the two Rick and Hershel captured. Sophia is the last walker to emerge and Rick steps up and shoots her.